In his research about why some things “go viral” on social media, author Jonah Berger discovered that one of the main reasons is that the item provokes emotion, whether good or bad. Think about it: if you had a nickel for each post you’ve seen about a cute kitten, you’d be rich! People share things that make others reach for a tissue. By the same token, negative emotions can result in sharing, such as when a news item about an injustice provokes outrage and calls people to action. In order for our faith formation to touch the heart, it needs to be much more than indoctrination. Bishop Robert Barron is fond of saying that, if you wanted to teach someone the love of the game of baseball, you wouldn’t hand them a rule book! Rather, you would invite them to play the game and to experience the joy of the game. We need to invite those we teach to experience the joy of discipleship while also deepening their capacity for empathy with those in need. I suggest four ways that we can and should touch the hearts of those we teach. Engage learners of all ages in works of mercy. We have too often limited experiences such as these to “service hours” for Confirmation instead of making them opportunities for all disciples of Christ to experience compassion and to share God’s mercy. Incorporate music and singing. I have written about this before; few things touch the heart like music and singing can! Utilize a language of mystery. While the primary language of the brain is words, the primary language of the heart is symbolic. 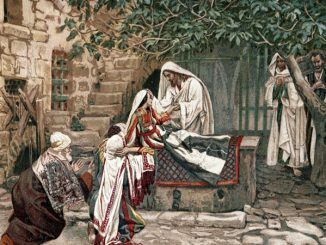 Our Catholic sacramental sensibility recognizes that the most profound moments in life transcend words. Instead Catholics rely on sign, symbol, ritual, silence, and movement. Engage learners in experiences of prayer. We should not limit ourselves to teaching others their prayers, but we should also teach students how to pray in such a way as to achieve what St. Ignatius taught: prayer should resemble one friend speaking to another. We touch the heart by engaging disciples of Christ in experiences of reflective prayer. Don’t forget to invite participants to share prayer intentions aloud as well; it touches our hearts when we hear others pray for real needs. 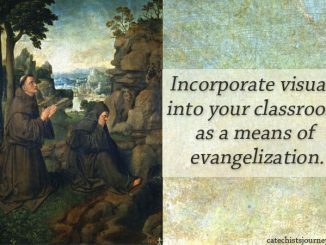 If faith formation were simply an intellectual exercise, we could simply provide every student with a book or a copy of the Catechism of the Catholic Church, have them read and study it, and then give an exam. That’s not how disciples are made, however. 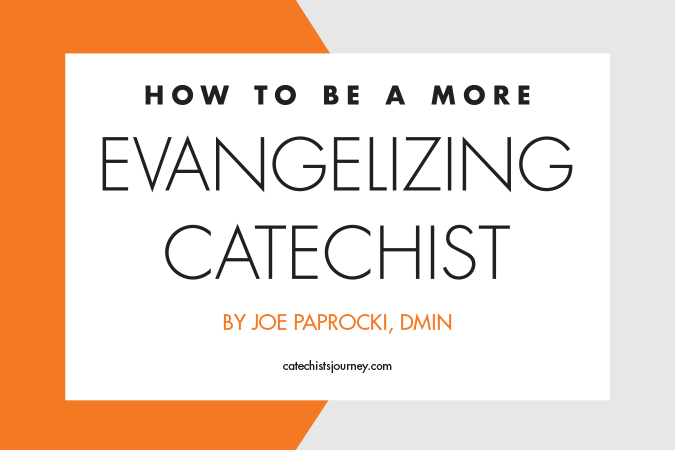 Faith formation requires flesh-and-blood catechists like you to touch the hearts of those you teach and to make them malleable enough to be shaped by the Lord! 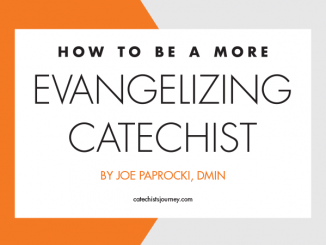 Read the other articles in the How to Be a More Evangelizing Catechist series. Download a flyer of the nine strategies. 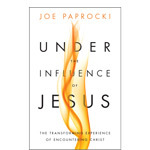 Go deeper with these ideas by reading my book, Under the Influence of Jesus: The Transforming Experience of Encountering Christ. It is good to be reminded of our missionary Duties, I will start the Prayer Missionary Discipleship this season with my students. Thank you Bernadette from St. Michael the Archangel Parish in Hudson Fl.